I want to thank Denise (http://lalasworldblog.blogspot.com/) for choosing me for this blog award. Thanks for being such a great source of inspiration! 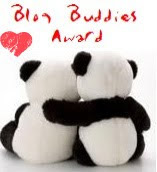 Aww Caro, thank you so much for the blog award, you have really made my day. It might be a couple of days before I get it posted on my blog just incase you are wondering what happend to it. Have fun going out with the hubby tomorrow. Congrats to you all - you all have wonderfully inspirational blogs! Caro, I just love that it made your day better :)) I love your blog and sweet comments you leave. I would have posted sooner, but I'm on holiday celebrating our 11th anniversary and the internet charges are brutal, lol.